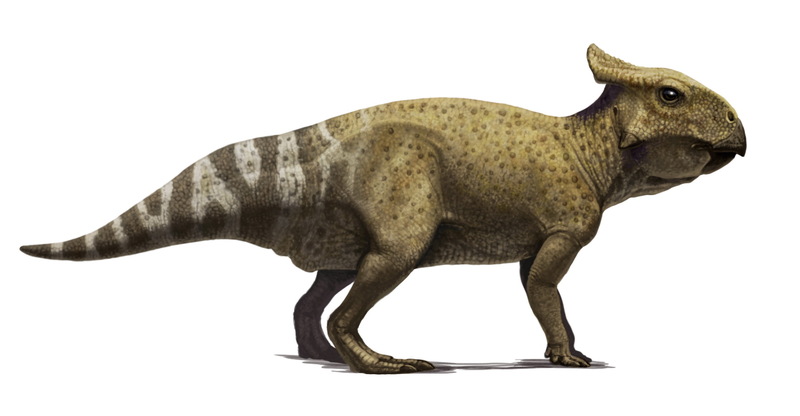 Although PLOS has many things to recommend it, one thing they don’t do is give you a lot of notice about publication and so actually the production of my recent paper on Protoceratops came shortly before the manuscript went online. As a result, although the paper had been around in various guises for several years, it was a bit too short notice to have everything ready for its publication, including both a press release from me and the following artwork. The superb illustrator Andrey Atuchin had very generously got involved in producing an illustration to come out alongside the paper, but his recent illness coupled with the limited notice put everything back. However, I am delighted that he has now completed his new work and allowed me to put it up here. Above is a simple (but fantastic) vignette of a single Protoceratops. This represents the age class of the block of four young animals that were the feature of the paper, with the reduced size of the frill and the overall proportions of the animal that does differ from what we see in adult animals. Although juvenile dinosaurs are often rare, there is a natural tendency for only full adults to be illustrated, or we see young animals only in the context of their parents or part of a herd and it’s great to be able to focus on a single animal, especially when the adult is already so familiar. This then makes the whole composition below rather unusual and of course very fitting for the paper. We see the group of juveniles together, devoid of adult supervision or as part of a herd but in their apparently natural aggregation. The environment of course reflects the Mongolian Late Cretaceous with a very sandy region and little real plant life. The overall composition though hints at the wider issues of the paper in a nicely understated way – the group are largely at rest, though remain vigilant and the fact that there are multiple individuals means even those not directly scanning the environment are not that vulnerable and the group as a whole are looking in multiple directions. Staying vigilant is especially important for young and vulnerable dinosaurs lacking the size, experience and defences of adults, and so they must with here a pair of Velociraptor on the horizon. My thanks of course to Andrey (who retains the copyright on these, please don’t share without permission) for this wonderful rendition of group living in the Cretaceous and nice of him to sneak some theropods in there so I can forget about my fall from grace and pretend that this is not just about ornithischians. It’s a wonderful piece and it really does convey not just the contents of the paper, but the issues at the heart of it, and even if you disagree with the hypotheses, it’s certainly evocative and really does show the concepts magnificently. 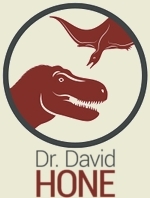 How did herbivores, including ankylosaurs, survive with “little real plant life”? No doubt LK Mongolia, in the Djadokhtan interval as at other times, was fairly arid. But an out and out desert paleoenvironment was questioned by an author in THE AGE OF DINOSAURS IN RUSSIA AND MONGOLIA. My understanding is that it was pretty lush around rivers but sparse elsewhere with patches of real sandy desert. Animals could have regularly crossed even large sections of dunes to get between patches to feed, so I don’t think showing them in deep desert, but there also being a decent amount of greenery to support larger herbivores and large populations of small animals is mutually exclusive. Consider that you have large-bodied mammals entering the Namib Desert (and thus potentially entombed there). 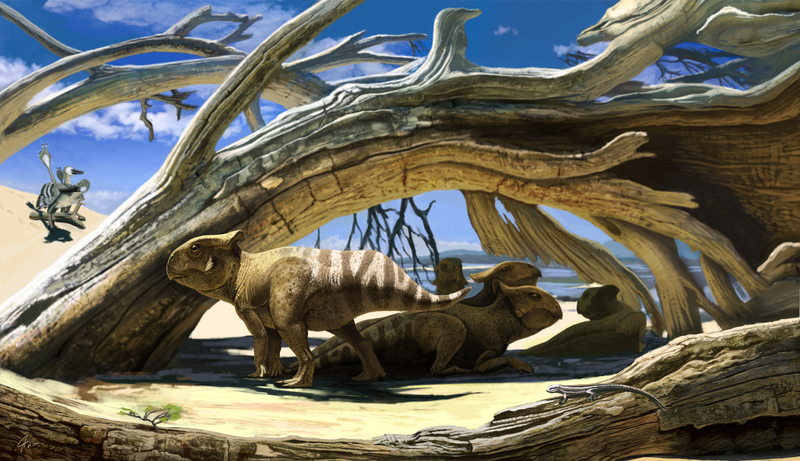 It’s odd, though, that Protoceratops is IIRC better represented at Tugrik than Alag Teg, and Bagaceratops appears absent from coeval Nemegtian habitat. As for desert elephants, I may have heard they went there to get away from humans. Cool post. It’s always awesome to see paleoart based on recent finds. I bet that it is really awesome to have high quality art made based on your findings!